How long does it take wine to overheat in a car on a hot day? I wrote this article in WellesleyWeston Magazine featuring local food & wine experts like Chef Ming Tsai, Mike O'Connell Jr., Chris Minervino, and Austin Moran. Check it out! I shared my thoughts on the direct shipment of wine to Massachusetts with CBS Boston during hearings at the State House. "Bob Dwyer, a Massachusetts-based wine blogger, has created the coolest parlor game in wine, and for once it’s a wine contest that does not involve blind tasting. I used to think the entire concept of a Top 100 list was silly. This year, mine was the first guess on Dwyer’s site." "Robert P. Dwyer of Wellesley, who blogs about wine at thewww.wellesleywinepress.com, calls the state’s liquor laws bizarre and favors a wider availability of wine. For consumers, it would be more convenient to be able to buy wine at a supermarket while shopping for food, he said." "trying to predict the annual Wine of the Year is a popular parlor game among enophiles. This year, blogger Wellesley Wine Press held a contest, with New York wine retailer Grapes the Wine Co. awarding a prize of a Kindle Fire e-reader to the first commenter to correctly guess this year's top wine before it was announced. Unfiltered was impressed with the number of Top 10 wines prognosticated by Wellesley's readers. "Senelwine" guessed Château de St.-Cosme Gigondas 2009, our No. 10 wine, "Mike M" guessed Quinta do Vallado Touriga Nacional Douro 2008, our No. 7 wine, "James Z" guessed Baer Ursa Columbia Valley 2008, our No. 6 wine, and "RichardPF" nailed it, winning the Kindle, and the respect of his wine-loving peers. Looks like Wellesley's readers know their wine." Boston's CBS affiliate WBZ-TV stopped by to discuss why wineries still can't ship wine directly to MA consumers more than a year after courts ruled they should be able to. WBUR, Boston's NPR news station, did an audio interview with me for a piece discussing MA Question 1: Repealing the Alcohol Sales Tax. The Chicago Tribune's Bill Daley mentioned the site in Rosé: A wine for more seasons. I said "For me, they're like pumpkin spice coffee drinks: best enjoyed early in the season". Bill alsogave the site a shout-out for a piece the Capitol Case Clubcontributed about restaurant wine service. I thought it was a great example of how print wine writers can effectively engage wine bloggers. The nice folks at Foodista, The Cooking Encyclopedia Everyone Can Edit, named this site Wine Blog of the Day for this entry featuring GoBYO. Thanks! Budget Bacchus named this site Wine Blog of the Week. Check 'em out! Boston University wine educator Stacy Woods mentioned this site alongside wine blogging powerhouses Vinography and Fermentation. Wow- that's great company to be in! Thanks- I appreciate it. Wine Enthusiast Magazine called me a "wine accessory guru". Thanks! I appreciate it. I submitted a piece on Shady Shelf Talkers to Palate Press that was published in its inaugural edition. NPR's Public Radio Kitchen linked to my pieces on "Syrah: The Steroids of the Pinot Noir World" and "Watching the Wine Community Rumble". Thanks for that! I am humbled, and I feel just a little bit like the Car Talk guys do when they say "And even though Roger Clemens stabs his radio with a syringe whenever he hears us say it, this is NPR: National Public Radio." The Boston Globe's website has been linking to my recent entries as part of their expanded local coverage includingWellesley. I truly appreciate that as it has driven a lot of local traffic to this site. It was really nice of Thomas Matthews, Executive Editor of Wine Spectator to leave a comment and then check back and answer some questions I had. Awesome guy! Check it out here. And here. Thanks to The Boston Globe for including The Wellesley Wine Press in their list of local blogs in the Food & Drink section. Check it out here. The Wellesley Wine Press was just added tohttp://wine.alltop.com. Alltop is an interesting topical take on sorting through the best sites on the Internet- check it out and see which sites are listed for topics you're most interested in. Gary Farrell Winery is a Sonoma producer best known for their well balanced Pinot Noirs and Chardonnays. Gary Farrell began producing wine in the area in the late 1970s. Along with folks like Joe Rochioli, Tom Dehlinger, Davis Bynum, Robert Stemmler and others, Farrell established what Russian River Pinot Noir and Chardonnay would become today. In 1982 he produced his first wine under the Gary Farrell label and gradually built its prominence. I first got to know Gary Farrell in depth at a winemaker dinner they had at Blue Ginger a couple years ago. Gary Farrell himself sold the winery in 2004. Current winemaker Theresa Heredia joined Gary Farrell in 2012. You may have tasted her wines before since she was the winemaker at Freestone (Joseph Phelps' Pinot Noir project) from its first vintage through 2011. I had a chance to taste through some of their 2013 releases recently. My notes are below. Their Hallberg Ranch Pinot Noir has consistently been one of my absolute favorites, and this vintage lived up to my high hopes. Hallberg is also the fruit source for Radio-Coteau La Neblina Pinot Noir (read more) and Emeritus (Wine Spectator Top 100 - read more). I hear Scherrer also does a great Pinot Noir from Hallberg. Definitely one of my all-time favorite vineyards in the world. Here's a link to a YouTube video about what makes Hallberg Vineyard special. Textbook California Pinot Noir. Bright, ripe black cherry aromatics with supporting smoky notes. Silky texture and uttery delicious. A finish that goes on for minutes in amazing fashion. Very special. Outstanding. Medium-bodied and more enjoyably powerful and weighty than its 13.8% alcohol would indicate. Golden with hints of green around the edge. Glass-coating and satisfying with attractivate aromatics and flavors of ripe pears, golden delicous apples, and a hint of toasted marshmalllows on the finish. Outstanding. Medium bodied with lively, potent aromatics and flavors. Classic California Pinot Noir notes. This is young and needs time, as there are some sharp edges at points. But after a night or two on the counter (simply recorked) those traits disipated and the wine held up brilliantly. Outsanding wine. Golden-hued with shades of green around the edges. Baked pears on the nose. Satisfying mouthfeel with commonplace Chardonnay herbaceous notes that stop me short of being wholly enthusastic about this medium-bodied white. Still, well-mannered and enjoyable. Question of the Day: Have you tasted Gary Farrell wines? If so, what did you think? 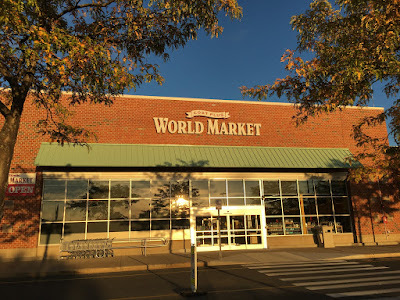 National retailer Cost Plus World Market opened recently in Framingham, MA. If you're not familiar with the chain it's sort of a mashup of Pier 1 Imports and Trader Joe's. Funky decor and unique grocery items, along with...wine! We had a chance to visit recently, about a week after their grand opening. The Framingham location is situated in Shopper's World where Office Depot used to be, next to Chipotle. I remember visiting their stores back in the day on the west coast. The wine assortment resembles Trader Joe's in that it introduces consumers to funky worldy picks along with a heavy dose of everyday red wines. The average price seemed higher to me than TJ's however, and there were fewer private label wines at World Market. The store was still being stocked when we visit, but the wine area takes up about 20% of the floor space, in the back right of the store. 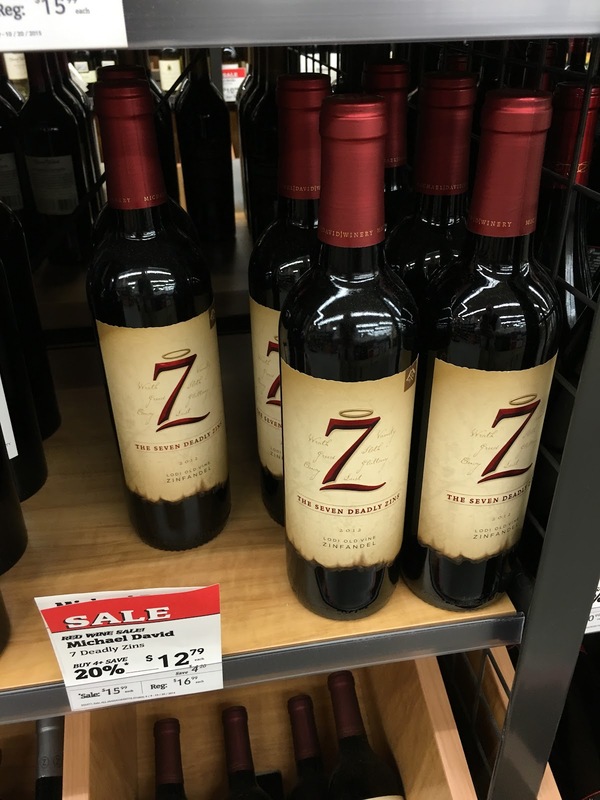 They were running a 20% off sale if you bought 4 bottles of wine. I rather liked that volume requirement. Totally reasonable (though not as good as Trader Joe's where the prices are fixed regardless of how many bottles you buy). Actually, the discount pricing was a little confusing. There's a regular price, a sale price, then a 20% off discount price if you buy 4 bottles, at leastt when I was there. Now that I look at my receipt I was charged $13.59 for the 7 Deadly Zins rather than the $12.99 mentioned on the sign below. Oh well, new store startup issues I guess, but it's an example of why I prefer a simple pricing structure. Here are four wines I picked up, and what I thought of them. There is a lot to like here in the $10-$15 range. Rich, inviting fruit backed by baking spices on the nose. Dark red velvet mouthfeel. Acidity is lacking but the flavors never get overripe nor pruney. Pairs well, for a red wine, with spice-driven dishes. And quite enjoyable on its own. I like it. 15.0% alcohol. I was looking forward to trying this as a new world winemaker's take on old world wines. Unfortuantely it didn't delivery a lot of excitement. Hints of Italy on the nose, but after that it was most just "there" with no differentiated appeal. Trendy looking label, but not a lot to get excited about. Non-descript entry level California Cabernet. I can usually do better at this price point. In certain settings I've enjoyed the regular Apothic Red more this "Dark" offering. Didn't seem any darker (visually, nor in weight) and it lacked depth. Rather sickly sweet and a bit smarmy. 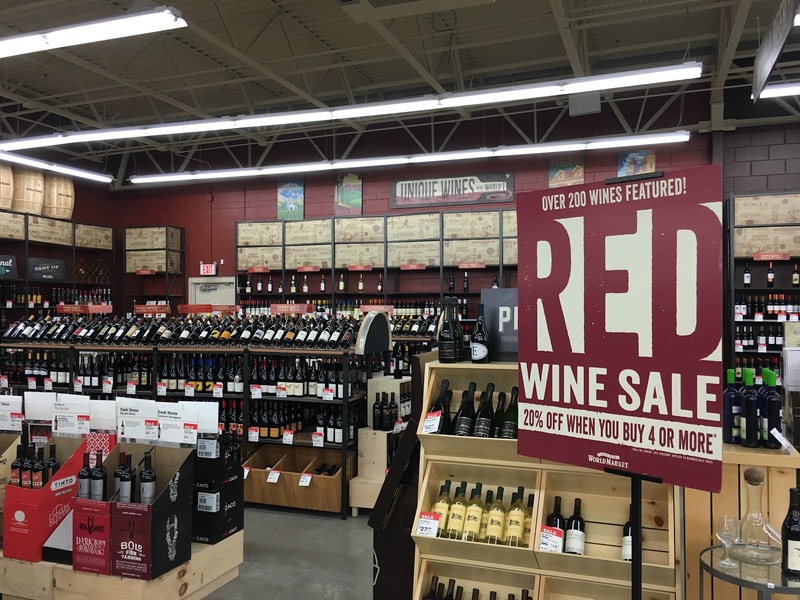 Cost Plus World Market continues the commoditization of retail wine market in the Boston area. Whereas we used to have primarly dusty bottled old guard retailers, we now have boutique fine wine retailers, more wine in grocery stores, and more chains coming into the area. I don't see this particular retailer filling a niche for me. Their sale prices can be beat at many grocery stores, and their assortment isn't particularly exciting. 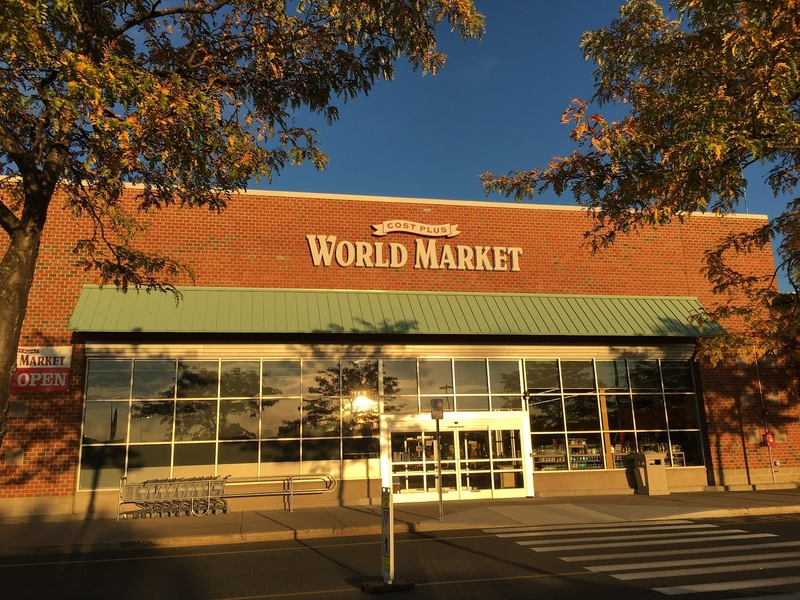 Question of the Day: Have you shopped at a Cost Plus World Market? If so, what did you think? Where is their assortment strongest? Is 2005 Bordeaux the “1990 Score Baseball Card Factory Set” of the Wine World? 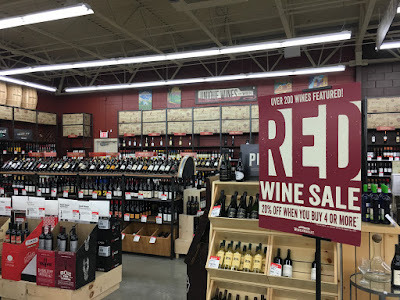 Is Trader Joe's a Good Place to Buy Wine?